Earlier this week Apple rolled out a metric ton of new products, including updated iMacs, a unibody Macbook, a new Apple remote, and a particularly unique mouse. The latter, dubbed the Magic Mouse, has already gotten the teardown treatment from iFixit, despite being out only a matter of days . The new Magic Mouse replaces the much-maligned Mighty Mouse, which annoyed users with its problematic roller ball and touch-sensitive side buttons (activated by squeezing the mouse). Apple also recently ran into legal issues over the Mighty Mouse's name (it's now simply the "Apple Mouse") According to various early reviews, Apple's Magic Mouse is a big improvement over the old mouse. So, do you want to see what makes the mouse truly magic? 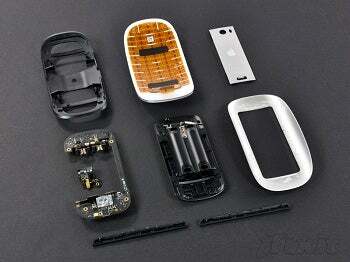 iFixit's recent teardown reveals all, showing off the new multi-touch mouse in it barest form. iFixit discovered that the magic is made possible due to the mouse being covered in capacitive sensors, all the way from the Apple logo and up. Additionally they learnt that the new mouse makes use of the Broadcom BCM2042 Bluetooth chip. For more on the Magic Mouse, check out our first look and see what one of our bloggers thinks.